Make the Right Choice, Enjoy Your Life Again! 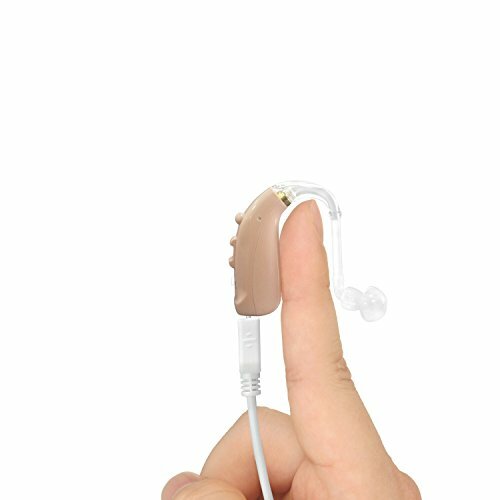 EASY USE AND COMFORTABLE FEATURE: Banglijian is a professional hearing aid manufacturer and seller, which have produced a variety of hearing aids. Our hearing amplifiers designed by audiologist are easy, durable, and comfortable to wear in either of the ears. RECHARGABLE FEATURE: Our hearing aid runs with high quality lithium battery, which saves your trouble to buy button batteries frequently. It can be used for 45-60 hours after charging 2 hours. It can be charged via USB cable, you are able to charge anytime and anywhere you want. EXCEPTIONAL FUNCTIONS: Our hearing amplifier has a full digital tone quality for low audio distortion and clearer voice. It also has a noise reduction feature that helps the user hear with maximum clarity. It's with full digital circuitry and adjustable volume control. It offers 6 volume levels and 3 program modes for different environments and is easy to control via button, which is more efficient and practical. GIFT DESIGN: Our rechargeable hearing amplifiers are offered with exquisite packaging and complete accessories. We provide the best storage protection. our hearing aids for adults or hearing aids for seniors will be great gifts for your friends or families. If you have any questions about this product by JIAHAO, contact us by completing and submitting the form below. If you are looking for a specif part number, please include it with your message.